I graduated college in 1996 with a Bachelor’s degree and almost no student loan debt. I was fortunate enough to have parents that helped me pay for my secondary education. Plus I worked summer and part time jobs to help pay some of the bills. So when I started working full-time (in 1997), I was basically starting with zero net worth … and almost no debt. Eventually I went on to earn a Master’s Degree which was fully paid for by my first employer. This helped me bump up my income in future years and put me in a position to get promotions later on in my working career. As I began earning a full-time income, I always felt I was doing a good job saving. I made sure to get any company match that was available and did some additional investing in my taxable brokerage accounts. But what I never realized is that I could have been doing more. A lot more in fact. If I had to estimate, I probably saved 15% of my income each year starting out … which included any company match. Not too bad. But not that great either. As years went by and my income increased, I slowly fell victim to lifestyle inflation. I still lived below my means, but I spent more than I needed. Looking back over the past 20+ years (most of my full time working career), I have realized my family could have reached Financial Independence (FI) if I would have done one thing different. 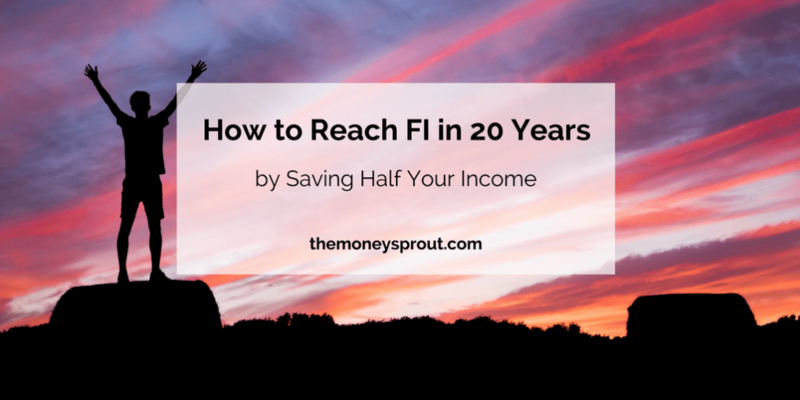 If I would have saved and invested 50% of my income … my family would have reached FI by now. How much do we need to become financially independent? We refer to this as our FI Number … which is highlighted below. A “back of the envelope” calculation puts our estimated FI Number Between $1.0 to $1.5 million … following the 4% rule. I know that is a very large range, but our financial independence number will ultimately depend on our future spending. For example, we currently spend right around $60,000 per year. If we continued with that level of spending, then we would need about $1,500,000 worth of investments to reach FI … based on the 4% rule. I don’t really expect to spend that much in the future … especially when we pay off our debts like our mortgage and car loans. But then again, I expect things like health care to increase and we will have 3 kids to eventually help get through college. On the lower end, I would expect to spend at least $40,000 per year at FI. We would need $1,000,000 worth of investments to reach our goals at that spending level … again based on the 4% rule. So our FI Number is somewhere in between that range ($1.0 to $1.5 million). 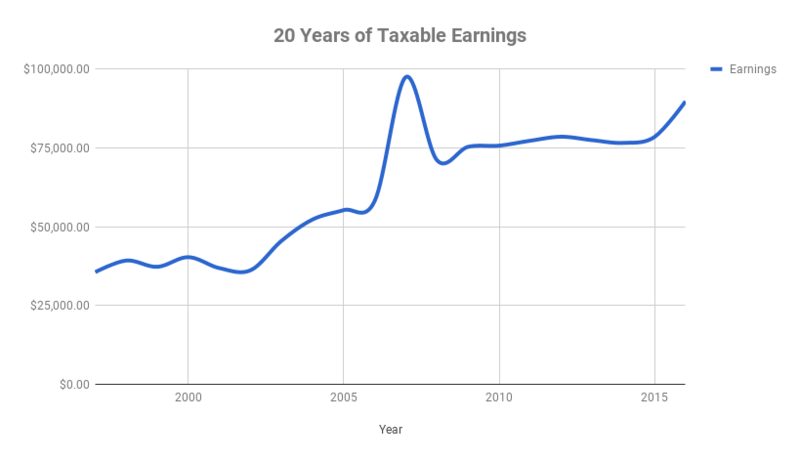 I recently ran some calculations on my earnings for the past 20+ years. In 1997, I started earning full-time income and haven’t stopped in 21+ years. For the most part, my earnings have gradually increased … except for a bump in 2007 when I took a new job and earned some incentives for moving out of my home state. Note – I grabbed these figures from my Social Security taxable earnings. Let’s take a look at my earnings over the past 20 years and how close to our FI Number we would be if we invested 50% of it. I actually had taxable earnings dating back to 1990 (when I was in high school) through 1996 from part-time employment. That money was used for spending and helping to cover part of my college tuition. For the purposes of FI, I really only want to look at when I started earning full-time income … after graduating college. Here is a chart showing my earnings over a 20 year time period (from 1997 to 2016) … after starting to work full-time. Overall, I have earned just over $1.2 million in that time in taxable earnings. That is a nice big number that caught my attention. What would have been an even more impressive number was how much I could have invested over those 20 years by saving 50% of my income. If I were to have saved 50% of my income for those same 20 years, I would have managed to invest just over $600,000! I always thought I had done a good job of investing … but never considered putting away 50% of my income. Here is a chart showing a “what-if” scenario for saving 50% of my income in that same 20 year period (1997 to 2016). Looks a lot like the earnings chart … except for half the money. What’s more impressive than saving 50% of your income? Investing that savings and earning compounding interest on it. For the purposes of my “back of the envelope” calculation, I will assume an average 8% annual return on my investments. Some years would have been lower … and some much higher. But a general consensus is 8% to 12% annual return on equity’s in the stock market over time. 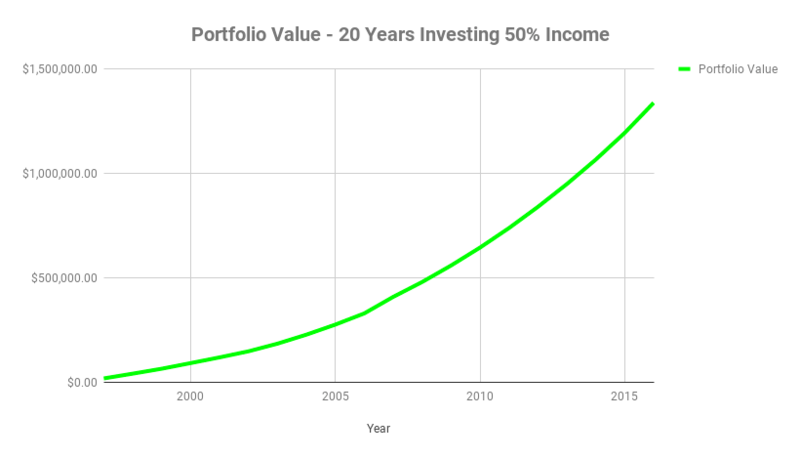 If I were to have invested 50% of my income in that same 20 year time period (1997 to 2016) … I would have built a portfolio of equity assets of approximately $1.34 million. This calculation takes in several assumptions like earning 8% consistent returns and being able to actually save 50% (and invest it) of your income. The power of having a high savings rate (50%) in combination with earning compounding interest would have put our family right in the middle of our FI Number! How amazing is that? If I were to have put these steps to work back in 1997, my family would have been at FI … and very comfortable if I might add, assuming a $50,000 to $60,000 spending range. Back in 1997, I didn’t know what financial independence was. I was young and fresh out of college. And while I didn’t live above my means … I didn’t have a high savings rate either. Now over 20+ years later, our net worth is about half of that $1.3 million … coming in just over $600,000. Things could be much worse I know … but what-if I could have invested half of the income I earned? We would be on auto-pilot right now and have the power to choose when and where we wanted to work. I can’t go back in the past and make changes to how we save. I feel thankful we don’t have a ton of debt and at least have a plan in place now to hit our FI Number … although it will take many more years. So instead of having regrets about our past savings rate, my wife and I are focused on what’s ahead and how we can reach our FI Number. 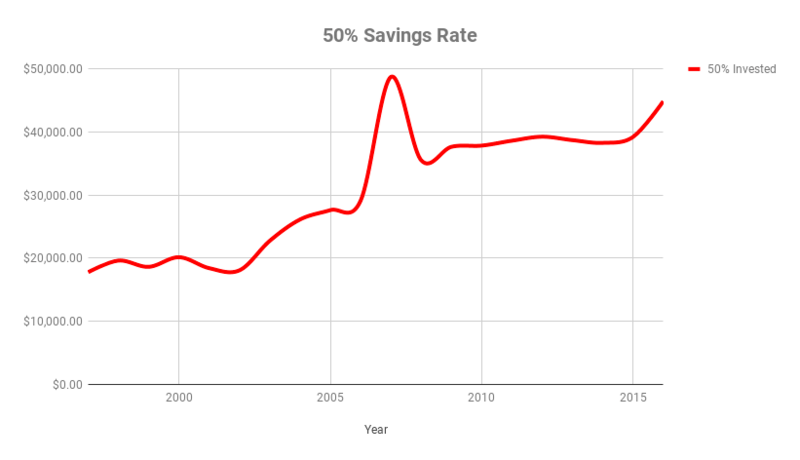 Now that I know the power of a high savings rate in combination with compounding interest … I want to educate my children on saving 50% of their income. 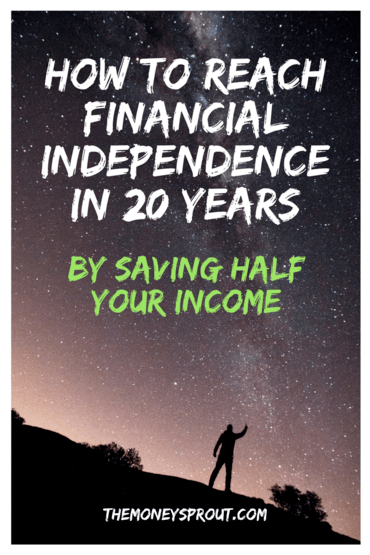 2nd Generation FI – Save 50% of Your Income! When you start a full-time job (after college), strongly consider saving 50% (or more) of your income. Invest that income in low cost index funds, a rental property, dividend stocks, or some other investment that can grow your money. Continue to live like a college student for as long as you can hold out. Don’t buy a house that is too big for your needs. House hack if you can. Try and limit your transportation costs as much as possible. Consider living in biking distance to your work. Having a high savings rate early on will give you the power to live the life you want! As you can see from my real earnings numbers, our family would be financially independent in less than 20 years (probably much sooner) if I were to have saved (and invested) 50% of my income.